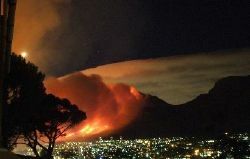 1:26 am: Flames rages at the Devil’s Peak. It seems like when the devil himself spits fire. 2:16 am: The fire moves forward and approaches homes in Vredehoek. The Fire Brigade still fights against the fire. 3:00 am: Vegetation at Devil’s Peak goes up in smoke. Cape Town City Bowl is blackened with smoke and the air full of ash. The fire approaches Table Mountain and Observatory now. 4:00 am: The fire and wind seem to calm down while firefighters prevent buildings from burning and evacuate neighbouring homes in Vredehoek. 7:00 am: helicopters try to calm down the flames. Other newssites report of 2 badly injured persons and 5 firefighters with minor fire injuries. 11.30 am: The fire is under control.Everywhere still smoke but the lower temperatures and decreasing winds prevented the fire from spreading to Table Mountain and homes. De Waal drive is still closed for traffic. 3:45 pm: Helicopter is still in action and tries to put out last fire sources. 6:00 pm: Helicopter no more in operation. Wildfire destroyed 510 ha of scrub- and woodland. No property had been damaged. One person died because of his fire injuries. 60 persones had to be evacuated but could return to their homes in the early morning. I’ve been tracking the fire from my apartment as well as getting constant updates through photographs, which you can view in the link I’ve left as my website.. I went up to Rhodes Memorial today, where the emergency crews were, and got a number of close ups of the action. I also managed to get some panoramas of the fire last night and this morning from my roof.